Vitamin A is always associated with eye health and carrots. This statement is not wrong, because it's one of the benefits of vitamin A to maintain eye health is by improving the integrity of the retina and the vegetables were carrots also contain pro-vitamin A or beta-carotene in the body which in turn is converted into vitamin A. However, you should know that vitamin A has another function to your body's health. Lack of vitamin A can cause eyes can not adjust to changes in light from outside. Early symptoms of vitamin deficiency in will cause you to hit the state in which night blindness is caused less clear vision at twilight. Given the function of vitamin A for eye health is so important that meet the needs of this vitamin in your body. Vitamin A is not only found in vegetable carrot, but also found in dark green vegetables such as spinach and orange fruits. In addition, vitamin A can also be derived from animals such as milk, liver, cheese, egg yolks and butter. 1. Vitamin A helps cells reproduce normally commonly called differentiation. If the body does not do will affect the differentiation of pre-cancerous conditions. 2. The second function of vitamin A that can help maintain healthy tissues. Therefore, this vitamin can help the wound heal. 3. Vitamin A is necessary for growth and development of the embryo and fetus, determine which genes in the formation of organs in embryonic development. 4. 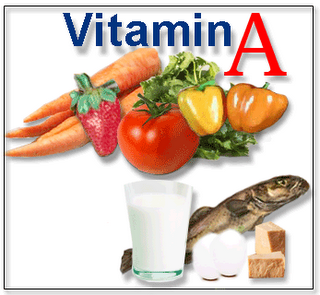 Vitamin A can help maintain the health and structure of the skin, hair and teeth. 5. Vitamin A can also help overcome skin diseases such as acne. 6. The last function of vitamin A is vitamin A needed in normal reproduction by affecting the function and the formation of sperm, ovaries and placenta. Vitamin A plays an important role in the formation of the sense of sight. This vitamin will help change the molecular signals from the received light beam or retina to be a projection of the image in our brains. Vegetables that contain a lot of vitamin A such as daffodils, spinach, spinach fried chips, bunkil taro leaves, red amaranth, velvetleaf leaf, guava leaf, leaves cashew nuts panjangl leaves and other green leaves, Gandaria, beans, kankung, chinese cabbage , pumpkin, soy pack, princess shy, young ranti, seaweed, mustard, clover, Hintalo eggplant and carrots. Examples are apples, country, persimmon, mango, papaya, banana, and breadfruit Sowa. Animal sources of vitamin A derived from chicken, duck, lamb kidney, beef liver, chicken liver, liver sausage, different types of fish (rabbitfish, skipjack, cork, kawalinya, clams, lehoma, malugis, crab, sardines, coral trout, and tuna Titang ), fish eggs and salted eggs. In addition there are also vitamin A naturally derived dri processed as head of milk, butter, fish oil, palm oil, fish flour and milk powder. Ever heard of low birth weight? Must have it. Well, low birth weight babies are going to bring a deficiency of vitamin A. Because infants with low weight, which weight less than 2.5 Kg baby more easily threatened by lack of vitamin A. In the development of the baby's age if not treated immediately get the intake of vitamin A, diseases such as night blindness, corneal xerosis be suffered. Other diseases such as autoimmune lung disease and ARI (Acute Respiratory Infection). Lung disease is caused by a lack of various vitamins, including vitamin A. Usually autonium disease of the lungs attacks the adults who have the habit of smoking. But it can affect the baby if the lack of intake of vitamin A. Because according to the table of vitamin deficiency, the vitamin A that gives a bigger impact on the body's T cells. T cell immunity is the effect on the body. Well, it turns out the benefits of vitamin A not only for the eyes just right? Hopefully some of the above it can be helpful to you.